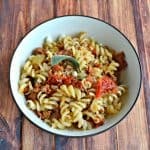 Alright, I’m back with another delicious pasta dish! This one takes 25 minutes from start to finish if you are able to multi-task. Since I’m a multi-task master, this was easy for me to do. If you aren’t a big multi-tasker then it might take you 35-40 minutes instead. 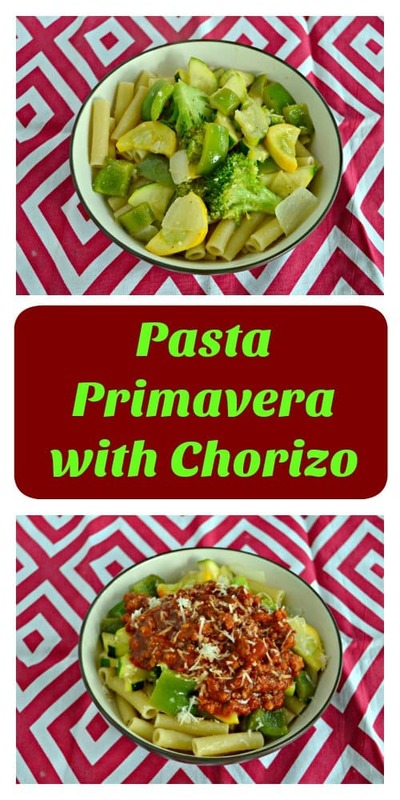 So this dish is Pasta Primavera with Chorizo. I love Pasta Primavera because it’s a simple dish with pasta topped with vegetables and garlic butter. Since I’m a huge buttered noodle fan this is my type of dish plus I get the nutrition from the vegetables. It usually has a touch of marinara sauce on top. I wanted to use a thick sauce and add in some chorizo. 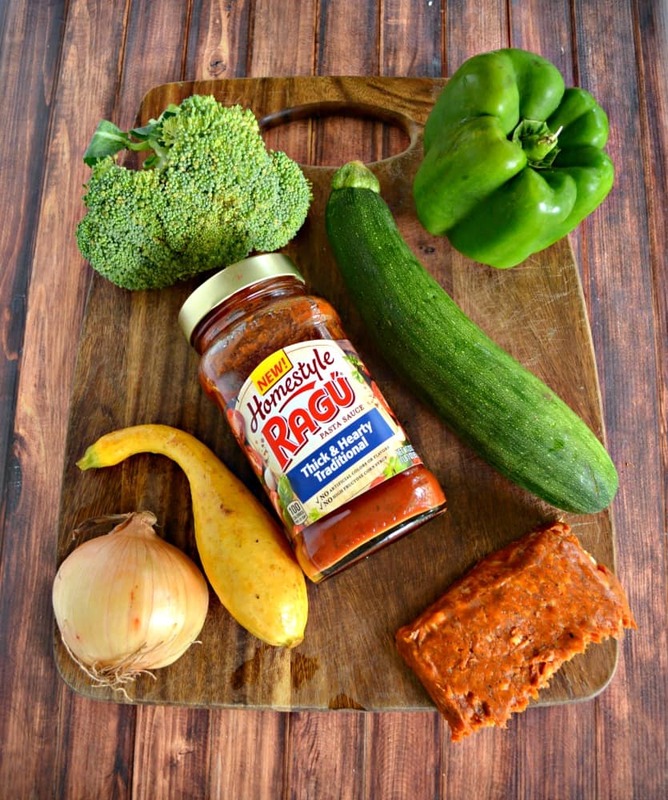 The sauce I chose to use is the new Ragu Homestyle Pasta sauce! I used the Ragu Homestyle Thick and Hearty Traditional Sauce. It’s great in this pasta because it hugs every single noodle. They peel, chop, and simmer their ingredients and use a special blend of herbs to layer and build the flavors. It’s so yummy! So this recipe starts with boiling the pasta. While that is working I like to saute the chorizo until it is cooked and then add in the Ragu Homestyle Thick and Hearty Traditional Sauce. I absolutely love the subtle sweetness of the sauce paired against the spicy chorizo. It’s a perfect match! Then I saute the vegetables until they are tender but soft. Next I add in a little garlic butter and that’s it! 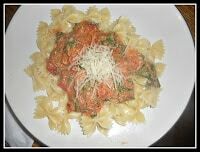 To put the meal together I like to put the pasta in a bowl, put a good helping of vegetables on top of that and finish off with plenty of sauce. This is the ultimate pasta dish. 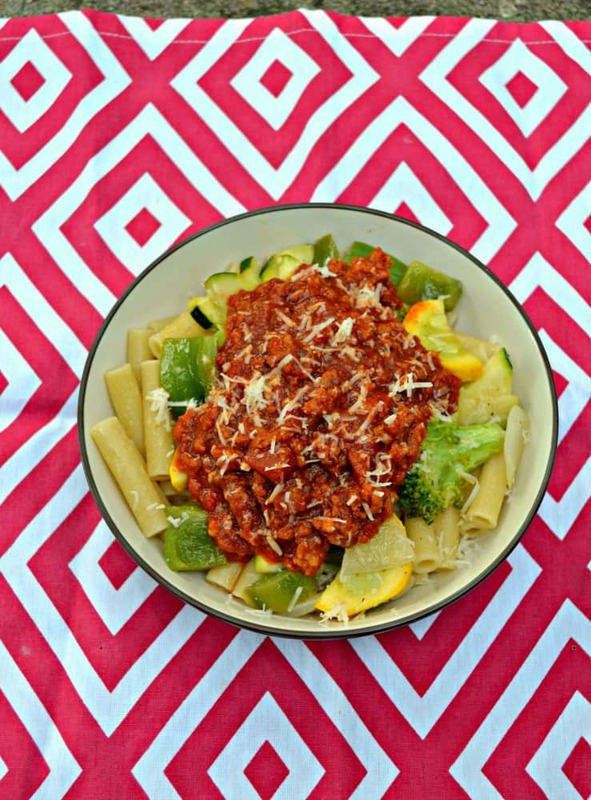 It’s got the pasta base topped with the garlicky vegetables all wrapped up in the Ragu Homestyle Thick and Hearty Traditional Sauce and chorizo. It’s sweet, it’s spicy, the herbs from the sauce come through and the pasta is the perfect vessel for it all. 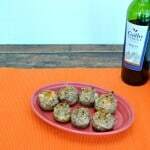 So I say give this dish a try! It’s the perfect way to enjoy a homestyle meal with your family and it doesn’t take all night to make so you can enjoy more time with the whole family! 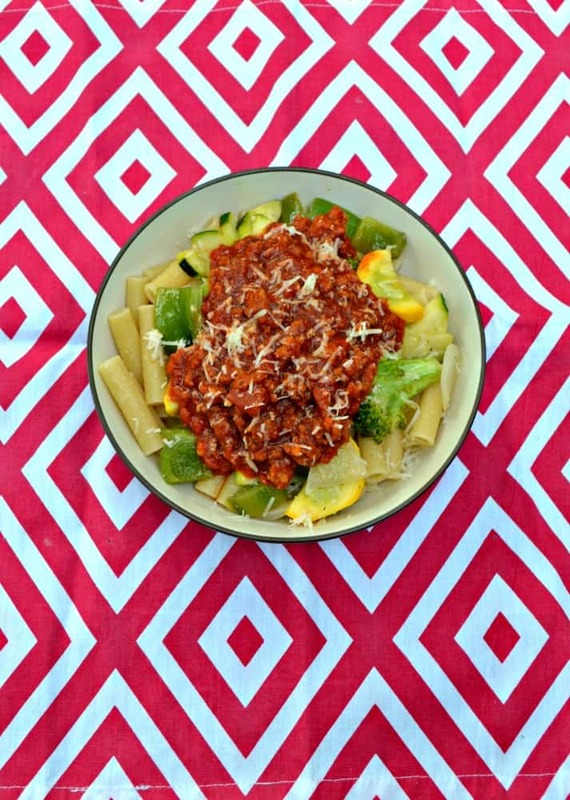 A classic pasta dish topped with vegetables in garlic butter and an amazing sauce of Ragu Homestyle pasta sauce mixed with spicy chorizo. Place the choirzo in a saute pan over medium high heat and saute for 6-8 minutes or until it is cooked through. Meanwhile, heat 2 tablespoons of butter in a medium saucepan over medium heat. 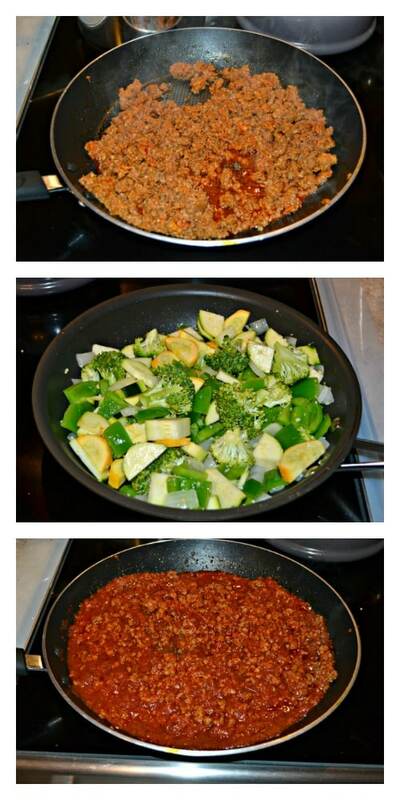 Add in all of the vegetables and saute for 5 minutes. Add the garlic, remaining butter, and cook for an additional minute. Sprinkle with salt and pepper. Meanwhile, add the Ragu sauce to the chorizo and mix well. Cook until heated through (about 3-4 minutes). To serve place 1½ cups of pasta in a dish. Top with a half cup of vegetables and then with a cup of the sauce. Sprinkle with Parmesan cheese. This looks so great. I love all of those veggies and the sauce looks so yummy too. I’m a multi-tasker as well, so a quick meal. I always like recipes that I can add a bunch of veggies to! Looks yummy. Thanks for the recipe! Oh, this is going in my recipe binder asap! 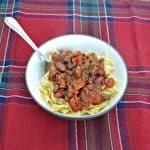 I love chorizo, and it sounds perfect paired with with sauce and pasta.